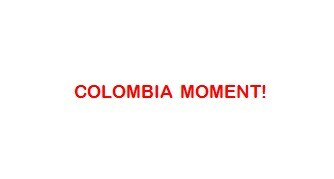 I am thinking of slapping a copyright on and registering the phrase “Colombia Moment”. 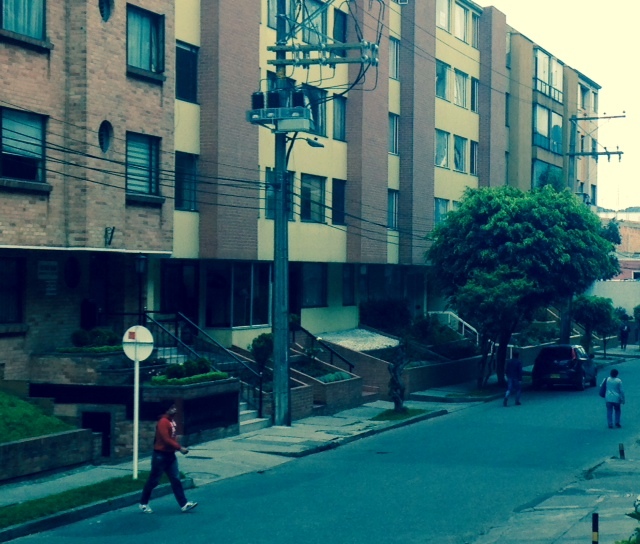 Over the years perhaps my recognition of Colombia Moments is waning as I become more acclimatized and jaded? I hope not, principally because I expect to be able to behave like a law-abiding and sane citizen should I move abroad again. I do not want Colombia Moments to get the better of me. I am sure I could have the name registered and design a slew of bumper stickers, mouse-pads, mugs and T-shirts emblazoned with the catchphrase, if the paperwork weren’t so fricking complex! All the same, within an hour of producing my moneymaking merchandise, everything would be copied and mass-produced chiviado. So, today I was tasked with locating and then purchasing a Une mifi modem. What’s this you ask? I didn’t know until after the fact either. So, I headed down to the Une office on Calle 84 and Carrera 14 where, as to be expected the queue was enormous. This was fine, after all, they had the Argentina vs Switzerland World Cup game playing and so I could busy myself with that whilst waiting for the 20-odd souls ahead of me to be served. Almost an hour later, I am assigned my turn and sent to a second line. The game is well into the second half by now and Une are helpfully sending me text messages alerting me as to how many people remain to be seen before me. They say that I am third in line but, six people are seen before my name misspelt (obviously) comes up on the screen. I explain that I am in need of a wifi mifi integrated modem option since the Telefonica Wifi (the only option available to date in Mompos) keeps crashing and going offline. It takes the better part of a week for the sole Telefonica engineer serving most of the Mompos Depression to come round and make a repair. We can call him up privately and pay him a 20,000 peso tip each time on the sly to see to our technical issue more rapidly. But, we have had the system for four to five years and you can only imagine what our “payouts” amount to now. We need a back-up option. I am promptly informed that Une has no coverage in the region of Mompos. This was a detail that they declined to tell me at the “information desk” since this isn’t there area. So, I managed to watch most of the game at Une. Caught snippets of extra time as I walked south along the Carrera 15 to Unilago where I was assured that I could solve my problem. I am sickened by the late Argentina goal knocking out Switzerland. Since Une has no coverage in Mompos, I head to a Tigo stand in the forecourt and buy an internet package for a month there after having the situation explained to me. I am informed by the salesperson that here in Unilago I will be able to get one of the modems needed. So, I head over to the Une stand and explain the predicament. I can do this for you says the patient and kindly lady manning Une’s desk. I explain calmly that this is not going to happen. I ask why it is so difficult to do anything. I know she is just trying to be helpful, but, have you ever bought anything on Mercado Libre? The least internet friendly Latin American version of eBay. It requires you clicking on the item you want. Receiving the email confirmation. You then need to call the vendor to confirm the sale. Once this is done, the vendor will pass on his banking details so that you can go and make a deposit into his account, plus the additional costs (10,000 pesos) of the deposit and then whatever it is going to cost to send you the item. No, I’m not doing this. To add to all of this it’s started to drizzle, not proper rain, just that irritating drizzle that is known here as llovisna or in some parts espanta flojos. Anyway, I am in a cab home feeling a little nauseous at the amount of time it has taken me to get to this point…of exactly nowhere. Alba sends me a text; she has bought the modem online through Mercado Libre. The only solution to the most offline of online vending pages is to call up the vendor and see if it is possible to go around and pay in person. After a short conversation with the seller, I am in a cab to a barrio beyond the Ciudad Salitre. It’s a 20 minute ride. I arrive and the seller’s mother is at the door of the apartment complex. She is the money taker, the young daughter runs up and down to the fourth floor as the courier and messenger to the (I suppose) geeky son making the sales. There are three people ahead of me in the line buying items from here too. Chit chat is made; I now know that the mother is from Santander, she knows I have a hotel in Mompos. I just want to get out of here. My “Colombia Moment” has occupied the better part of five hours today. This entry was posted in Journalism and tagged bureaucracy in colombia, colombia, colombia moment, la casa amarilla, mompos, paperwork in colombia, tigo, une, wifi connections in colombia. Bookmark the permalink.